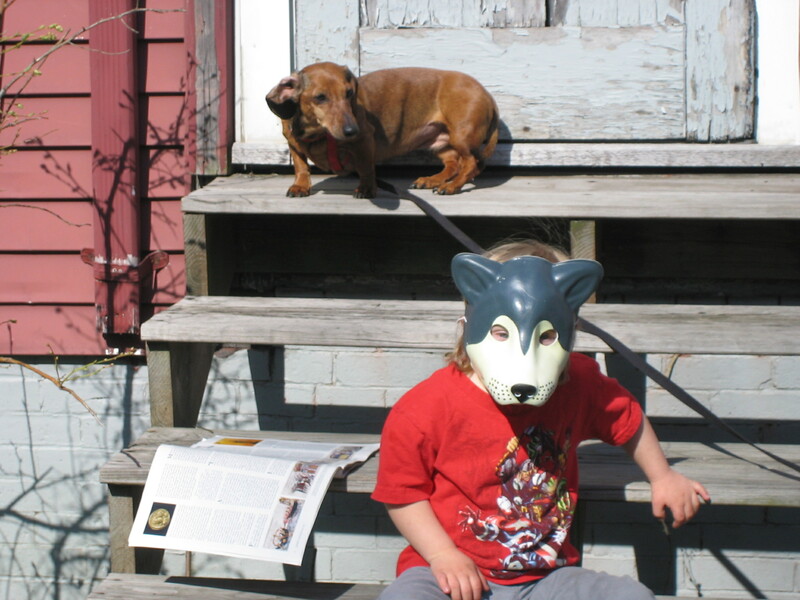 Well, it’s actually our kid’s life as a dog. 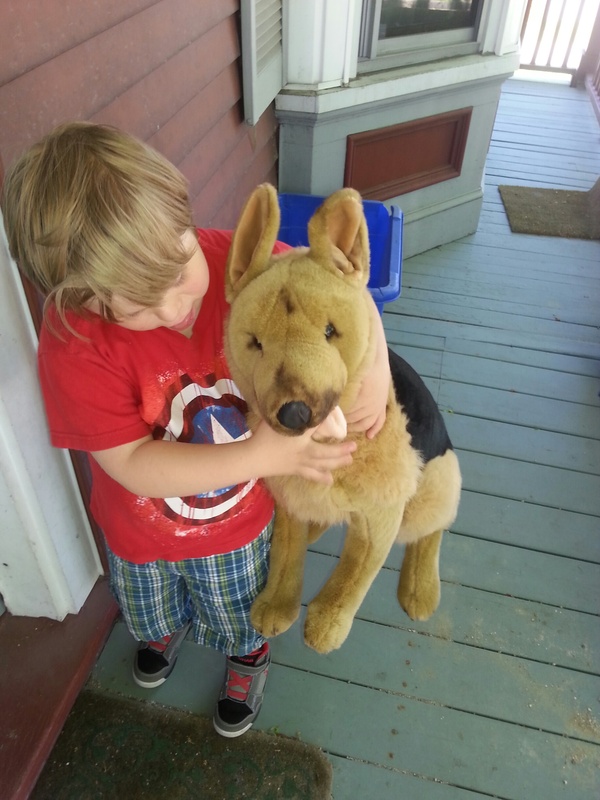 Today someone dropped off a Walt-like* stuffed animal on our porch today. No note just the dog waiting obediently. “The creepiest kind. Leave it”, he said as he walked in the house. “I think we should take it in”, I said. Of course it was from good neighbor, Clara, who is a fan of Thorin and Walt. This experience and my post from last week reminded me of a period in Thorin’s history I never wrote about. Thorin pretended he was a dog. His name was Little Walt, a self-chosen name. the real dogs loved this because they would get them, too. He would crawl in a circle before lying down. He slept at the end of his bed. Kisses were licks on the face. He (tried to) drink out of the water bowl on the floor. He barked at dogs passing by the window with the “other” dogs. He peed outside before I could stop him. I have to ask here is there any male who hasn’t? 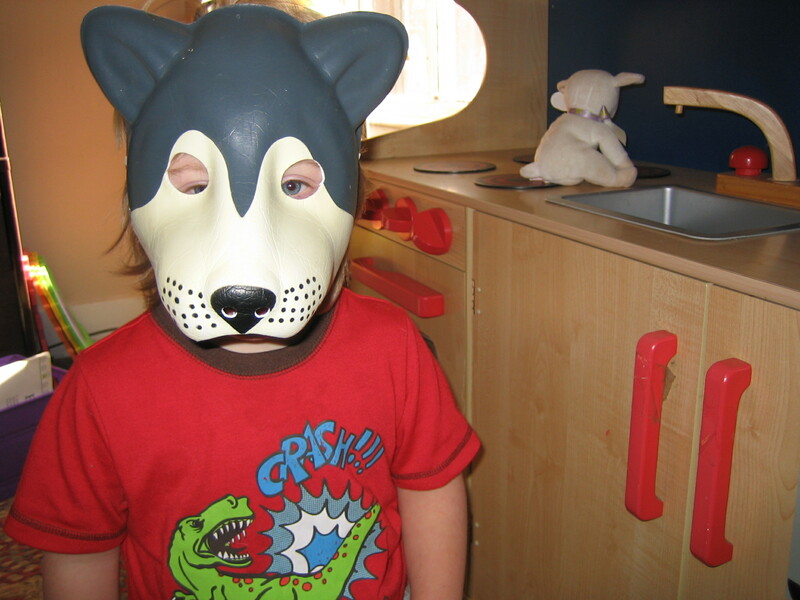 Back then, one of the pre-school teachers –who knew nothing of his alter ego — shared with me that Thorin was running around on all fours and barking at school. She looked at me in that worried teacher way, “That might not be a good idea”. “I wouldn’t encourage it” she said. I had decided at some point some times it’s better to “Yes” people. I can’t fight all these senseless battles. When he and I were in the car I said, “Little Walt, I have something to tell you”. He nodded his head solemnly from the back seat. Little Walt disappeared when Thorin decided he should as it should be. *Walt is our German Shepherd with almost identical coloring. ** To be fair Ward was a huge fan of Little Walt and peeing outside. Is that a :) or a :(. This entry was posted in Adopting, Advocacy, By Notatypicalmom, Down syndrome, education, humor, Inclusion, Parenting, Random life, social commentary, Special Needs and tagged Down syndrome, imaginary play, inclusion, parenting humor by Kari Wagner-Peck. Bookmark the permalink. They are:) It sounded funny though. Great post! I forgot about that. Oh ugh a teacher discouraging imaginative play is heart wrenching! Little Walt sounds like an awesome game.